The Murray Mouth, Coorong, and Lower Lakes significant ecological asset (SEA) is located at the downstream end of the river system. The Coorong, Lake Alexandrina and Lake Albert form a Ramsar listed site (Figure 6.1). The Coorong is a long, shallow lagoon, 140 km in length, separated from the Southern Ocean by a narrow sand dune peninsula (the Younghusband Peninsula) (Figure 6.2). A system of barrages, which includes 593 independent, manually operated gates across five structures, was constructed between 1935 and 1940. The barrages isolate the estuarine area including the Coorong from the Lower Lakes (lakes Alexandrina and Albert). The water in the Coorong varies from fresh to marine to hypermarine depending on flow over the Barrages and the degree of Mouth opening. A major cause of the decline in the environmental values of this SEA is the considerable change to the flow regime relative to natural conditions (for example, the median annual flow past the barrages is 27% of what it was under natural conditions - as if there was no regulation in the catchment). According to indicators developed under the original pilot Sustainable Rivers Audit framework, this river zone, being at the downstream end, is under the greatest hydrological stress of any in the River Murray System. The First Step Decision Interim Ecological Objective for the Murray Mouth, Coorong and Lower Lakes is to achieve a healthier Lower Lakes and Coorong estuarine environment. The expected outcomes are: open Murray mouth; more frequent estuarine fish spawning; and, enhanced migratory wader bird habitat in the Lower Lakes. These outcomes will be achieved through various management opportunities, described later in this chapter. The following sections describe the characteristics of the SEA, exploring the links between the biophysical condition, the hydrological condition, and other factors. Figure 6.1 - Murray Mouth, Coorong and Lower Lakes. Source: MDBC. Figure 6.2 - The Murray Mouth, Coorong, and Lower Lakes. Note the five Barrages between the Lower Lakes and Coorong. Source: Geddes and Hall (1990, p. 201). The Coorong and lakes Alexandrina and Albert Ramsar Site was listed under the convention in 1985. The total area of the site is 140,500 ha. The wetlands specifically included are Lake Alexandrina, including all the islands (76,000 ha); Lake Albert (16,800 ha); and the Coorong (47,700 ha) (Figure 6.2). The area is mostly Crown Land (water) and National Park and Game Reserves. The Lower Lakes are surrounded by private property. The Coorong is reserved as a National Park and Game Reserve, and is surrounded mainly by National Park and Game Reserve (DEH, 2000). The Ramsar site is part of the East Asian-Australasian Shorebird Reserve Network. The primary reason for the initial Ramsar nomination was the diversity and abundance of waterbirds that used these wetlands, but the nomination also recognises the diversity of wetland habitats present (Paton, 2000). The wetland site consists of ocean beach, together with the Mouth of the River Murray and associated lakes and estuary areas. The Lower Lakes form a natural wetland system with associated shoreline marshes at the Murray Mouth. The Coorong is a long narrow wetland complex consisting of saline marshes, samphire, freshwater soaks and open water, with a hypersaline area at the southern end that is regarded as important because it is a particularly good example of this kind of habitat (Paton, 2000). The area also contains a number of ephemeral salt lakes and examples of ephemeral carbonate lakes of national and international importance (DEH, 2000). Many of the birds and other animals that use the Ramsar area also move to and from other wetlands, so it is an open ecosystem. There is a high diversity of species, with waders and waterfowl predominating. A total of 85 species of waterbirds has been recorded in the region, with 35 recorded in the Coorong (Carpenter, 1995). Many of the waders are seasonal migrants to Australia and breed in Alaska, northern China and Siberia. The area is particularly important for Red-necked stints, Sharp-tailed sandpipers and Curlew sandpipers, all protected, along with other species, under JAMBA (Department of Foreign Affairs, 1995a) and CAMBA (Department of Foreign Affairs, 1995b) agreements (Edyvane et al., 1996; DEH, 2000). The Coorong and estuary wetlands ranks among the top three sites in Australia for seven species of wader (Paton, 2000). The area supports large numbers of some species of waterbirds, and others are present in lesser numbers, including the endangered Orange-bellied parrot, which over-winters in the reserve. The Coorong is an important breeding area for the Australian pelican, Crested tern and Fairy tern, and Lake Alexandrina is important for egrets, ibises, cormorants and the Rufus night heron (DEH, 2000). In terms of species richness and overall numbers of waterbirds of all kinds, the Coorong and Lower Lakes site ranks within the top six waterbird sites in Australia (Paton, 2000). On a state basis, the area contains more than half of the waterbirds that occur in South Australia, and one quarter of all the birds in Australia. The lakes are fringed with tall reeds (Phragmites spp.) and bullrush or cumbungi (Typha spp.). This lakeshore vegetation forms an almost unbroken habitat corridor around the lakes which plays a critical role in allowing movement of birds and other animals under protection from predators. The Coorong contains endemic plant communities of Musk grass. A survey of fish by Eckert and Robinson (1990) reported 59 species, and since that time a further six have been added to the list. The fauna, which includes reptiles, turtles and ten species of frogs, is still composed of native species, although introduced species are also present (DEH, 2000). The northern half of Hindmarsh Island formed during the last interglacial (125,000 years BP). The interglacial shoreline parallels the modern shoreline several kilometres inland. The natural River Murray estuary is a Holocene (last 10,000 years) feature occupying Quaternary interdune areas, and formed as a result of a sea level rise of about 150 m that accompanied deglaciation from 17,000 to 7,000 years BP (Bourman, 2000). The coastal barrier system developed from about 7,000 years ago and subsequently the barriers have migrated landward (Bourman, 2000). The simple model of Holocene sea level change in the Southern Hemisphere proposes that the rise in sea level after the last glaciation ceased about 6,000 years ago, when the sea reached its current level, and it has been relatively steady since that time. However, Baker and Haworth (2000a; b) recently proposed that sea level in Australia has declined significantly over the past 6,000 years, and that this change has been oscillatory. In agreement with this hypothesis, Bourman (2000), described the formation of extensive marine sand flats in the River Murray estuary approximately 5,000-6,000 years ago when sea level was about 1 m higher than at present. Aeolian (wind-driven) processes have been, and still are, active in this environment, creating migrating dune systems (Bourman, 2000). The position of the Murray Mouth has migrated over 1.6 km since the 1830s, with migrations up to 6 km over the past 3,000 years. Movements of 14 m over 12 hours have been observed. Thus, the Murray estuary is naturally a geomorphologically highly dynamic area (Bourman, 2000). The River Murray estuary would have naturally offered a wide range of fresh, brackish, saline and hypersaline systems (Newman, 2000). The Mouth was always relatively narrow, so the interface with the sea was localised. The winter and spring river flows would have maintained the opening in most years, although in dry years, and during the low flow periods of the year, there would have been considerable tidal exchange and semi-marine conditions would have prevailed. Mouth closure would have been an occasional possibility under the natural flow regime (Newman, 2000). The northern part of the Coorong would have received frequent freshwater inflows, but the Southern Lagoon would have been highly saline, much as it is today (Newman, 2000). The lakes would have fluctuated in level over a range of about 0.0-0.5 m AHD (Australian Height Datum) giving water depths in average hydrological years of 1-2 m (Newman, 2000). Salinity would also have varied with water level. There would have been a natural interchange of water between the Lower Lakes and the Coorong/Goolwa channels and the Southern Ocean. As well as water exchanging through the main deep channels, flow would also have passed through the smaller and more elevated channels on Hindmarsh, Tauwitchere and Mundoo Island. Although the hydrology and geomorphology of the Murray estuary is now highly modified and is largely freshwater, three factors are currently operating in the direction of driving the system to its former estuarine status: sea level rise associated with global warming; land level subsidence due to tectonic dislocation; and coastal erosion that could increase the likelihood of a breach of the barrier (Bourman, 2000). From the earliest days of settlement, landowners along the lower reaches of the river were making strong representations for the construction of barrages, primarily to keep the water fresh in the lower reaches of the River Murray, as well as in Lake Albert and Lake Alexandrina (MDBC, 2002). • to maintain pool water that can be pumped to Adelaide and the southeastern corner of South Australia (MDBC, 2002). The mean water level upstream of the barrages is held at about 0.75 m higher than mean sea level (AHD). The barrages cause an increase in water level of approximately 0.5 m as far upstream as Lock 1 at Blanchetown (274 km upstream) (MDBC, 2002). When River Murray flows are limited to entitlement flows in summer, evaporation exceeds inflow and the lake level drops. Since the 1980s, to ensure security of supply at the end of the irrigation season, the lakes have been surcharged by 100 mm to 0.85 m AHD at the beginning of summer. Under these conditions, the barrages remain closed, and by autumn the level of the lakes has reduced by evaporation to 0.6 m AHD (Jensen et al., 2000, p. 107). Water levels must be maintained above a minimum level of 0.6 m AHD for irrigation activities around the lakes. Lake levels above 0.85 m AHD cause fresh water to spill over the low-level island causeways and cause inundation of shallow areas adjacent to the lakes, and landowners also consider that foreshore erosion is aggravated at the higher water levels (Parsons, 200). In years of above entitlement flow, when flow at Lock 1 exceeds 15,000 ML/d, opportunistic cycles of raising and lowering lake levels are employed. The reason for this is to drain the more saline water from Lake Albert to the sea (via Lake Alexandrina) during the lowering phase, and to replace it with fresher water during the raising phase, lowering the salinity of Lake Albert (Parsons, 2000). The barrages block 7.6 km of previously navigable channels, and prevent ingress of water to Lake Alexandrina. This maintains fresh water in the Lower Lakes and River Murray. Before the barrages were built, tidal effects and the intrusion of seawater were felt up to 250 km upstream from the Mouth of the River Murray during periods of low flow (MDBC, 2002). Operation of the barrages has led to significant alteration of the hydrology of the Lower Lakes and Murray Mouth area, and of course, flows at the Mouth are affected by all the regulating structures upstream (discussed in Section 6.3.2). Currently there is very restricted flow through Mundoo and Boundary Creek Barrages, even when they are open (Bourman, 2000). Natural rates and patterns of ebb and flow have been constrained. There is now an abrupt interface between the fluvial and tidal reaches, reducing the size of the estuarine component to 11% of its pre-barrage scale (Bourman, 2000). The remnant estuary can change abruptly from saline to fresh conditions and back again in an unseasonal and unnatural pattern (Newman, 2000). Shoreline erosion in lakes Albert and Alexandrina has been measured at rates up to 10 m/year in some locations, with an average of approximately 1 m/year. Bourman and Barnett (1995) attributed this mainly to a reduction of sediment input from the River Murray. Prograding shorelines have developed in sheltered areas of the lakes. The growth of these features is linked to the increased rates of erosion in other areas. The long-term net accumulation rate of 0.5 mm/year is significantly less than the short-term rate of 1.7 mm/year, which suggests that the sedimentation rate has accelerated since regulation (Bourman & Barnett, 1995). Further evidence is provided by the relatively recent change in facies from bioclastic sands to muds in the upper sediments of the lower channel. Sedimentation has occurred upstream of Goolwa Barrage at a rate of 4.5 mm/year over the last 50 years (Bourman & Barnett, 1995). Figure 6.3 - Photographs of the Murray Mouth at two points of time. For a time series of photographs from 1978 to 2002 see MDBC and DLWBC (2002). Although the Murray Mouth would have occasionally closed under the natural flow regime, the regulated regime presents conditions that are more conducive to closure. Persistent low flows and their effects on promoting sediment build-up at the Mouth are not new, but since regulation they have increased in frequency and duration (Walker, 2002a; b). A closure under the current flow regime has serious consequences for the local business and recreational users of the area and also for the ecology, which exists in a hydrologically and geomorphologically highly modified environment. The prospect of Mouth closure has implications for the health of the biota, so the processes associated with the risk of Mouth closure will be briefly explored. 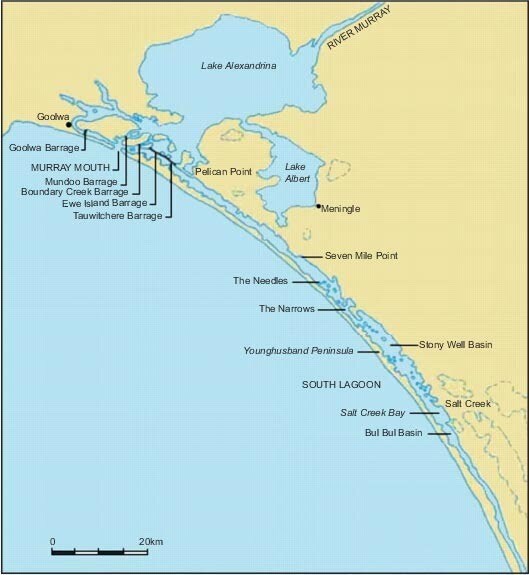 The only time that the Murray Mouth has closed in recorded history was in 1981 (DWLBC, 2002), although dredging probably prevented Mouth closure during 2003-04. 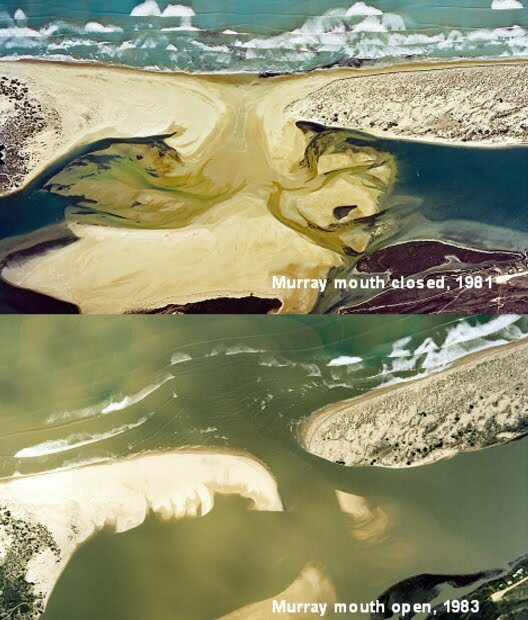 Photographs of a closed Murray Mouth (in 1981), and a wider channel at the Murray Mouth (in 1983), are shown below. After closure in 1981, the Mouth was opened artificially, and maintained in an open condition by the following winter and spring river flows. When the Mouth closed in 1981, the blockage involved not just a plug of sand at the Mouth, but also unusual build up of the extensive Bird Island flood tidal delta over the previous months. Over time, this flood tidal delta has gradually developed and consolidated landward of the Murray Mouth, primarily due to lack of discharge through the Mundoo Barrage (Bourman & Harvey, 1983). The continuing growth of Bird Island has the potential to result in more frequent and more permanent blockage of the Mouth (Jensen et al., 2000, p. 27). In a scoping study by ID&A (2001b) the estuarine areas between the barrages and the Murray Mouth and the samphire communities were considered to be under extreme risk of degradation under the current management regime, with a real risk that obligations under the Ramsar convention will not be met. Unfortunately there are no estimates of bird numbers before the construction of the barrages, so there is no way of assessing the change since the hydrological conditions in the estuary were substantially modified. Large numbers of some bird species are known to be present in the area. For example, in excess of 50,000 Grey teal and a large number of Australian shelducks can be present at a given point in time. There are also significant numbers of Black swans, and about 2,000 Cape Barren geese during the summer months (DEH, 2000). Paton (2000; 2002) reported that the numbers of almost all species of waders and waterbirds using the wetlands of the Coorong and Lower Lakes were considered by experts to have dramatically declined, particularly over the past 30 years. In the 1960s, more than 250,000 small migratory waders were recorded in one section of the estuary, in the 1980s the numbers had dropped to 20,000-35,000, and in the 1990s and 2000s only 3,000-13,000 were recorded over the entire estuarine system (Paton, 2000; 2002). For one species, Red-necked stint, the reductions in numbers over the past 20 years is alone sufficient for it to be classified as endangered (Paton, 2002). While it was acknowledged that the trend of lower bird numbers also applied on regional and national scales, the decline in total populations in the region between the barrages and the Mouth were considered to be greater than the general levels of decline noted elsewhere (Paton, 2002). Also, the declines are not easily explained in terms of universal factors operating external to the Coorong, because numbers have not declined everywhere. For example, the numbers of Red-necked stints have not shown a decline in Westernport Bay, Victoria over the same period (Paton, 2002). Paton (2002) concluded that the declining abundance of migratory waterbirds was associated with declining habitat quality, and predicted that Mouth closure would exacerbate the degradation. The decline may also be linked to more frequent constriction of the Mouth that limits tidal exchange and water level variability. The drastic reduction in the area of estuarine conditions following construction and operation of the barrages has greatly reduced the habitat available to waterbirds, which rely on estuarine-type habitats (Jensen et al., 2000). There are no descriptions of the flora of the Coorong and Lower Lakes area prior to construction of the barrages, but Ganf (2000; 2002) used ecological knowledge to infer the status of aquatic plant communities of the estuary prior to modification. The basis of this was the knowledge that the previous dynamic nature of the estuary would have allowed a succession of plant communities to come and go. In turn these communities would have provided habitat for birds and other animals, as well as contributing to the primary production of the ecosystem. The currently observed distributions of plant communities according to salinity gradients allowed Ganf (2000; 2002) to reconstruct the likely past distributions based on knowledge of the hydrodynamics of the estuary prior to construction of the Barrages. According to Ganf (2002), weed invasion and a dramatic reduction in plant biodiversity has occurred due to various factors (including grazing and changes to water level, salinity and turbidity regimes). The aquatic flora is now restricted to the littoral zone and inshore areas, while anecdotal evidence suggests that these plants were once more widely distributed. Floodplain vegetation communities are also degraded (MDBMC, 2002). The lack of many submerged plant species within the Lower Lakes appears to be correlated with the reduced light penetration associated with increased turbidity. This, in combination with the unconsolidated nature of the bed sediments, has acted to restrict vegetation growth to the near-shore areas, where it is subject to wind and wave forces (Ganf, 2000).The original flora of the Coorong and Lower Lakes would have been dominated by those species able to tolerate both saline surface waters and high root zone salinities. Plants such as the macrophyte Widgeon grass would have dominated the more saline areas (Ganf, 2000; 2002). The recruitment of the previously widespread Swamp paperbark, an important species for waterbird nesting, has been inhibited by the regulation of water levels (Denton & Ganf, 1994). The plant has the ability to grow in water-logged soils, but it is unable to tolerate flooding of the above ground component because the supply of inorganic carbon is then restricted to an aqueous source. Increased water levels may be one reason for a lack of juvenile recruitment along with other factors such as grazing pressure and timber removal. The management of the saline-freshwater interface over a very narrow range has effectively removed the habitats that represent the transition from saline to freshwater. As a consequence, flora adapted to this transition zone is poorly represented (Ganf, 2000). The health of River Murray freshwater macroinvertebrate communities is generally poor, with a pattern of decline towards the Mouth (Norris et al. 2001). Similarly, estuarine macroinvertebrates have also suffered reduced habitat area (Geddes, 2000). The high productivity of the macrophyte beds and the open water of the Northern Lagoon of the Coorong supports a highly productive macroinvertebrate fauna (Geddes, 2000). The macroinvertebrate assemblage of the Coorong Northern Lagoon and Murray Mouth is similar to that of other southern Australian estuaries, but the diversity is relatively low, with Geddes and Butler (1984) collecting only 21 species, compared to over 100 in other estuaries. The relatively low diversity is thought to reflect the extreme fluctuations in salinity (Higham et al., 2002). The study of Geddes and Butler (1984) was done at a time of low freshwater inflows and the identified community thus reflects hypermarine conditions. A later survey, following a significant inflow of freshwater, surprisingly only added a further two species (Geddes, 1987). This was explained in terms of insufficient duration of inflows. The Southern Lagoon is characterised by a restricted hypermarine fauna. Fauna of the Mouth, Coorong and Lower Lakes are adapted to extreme fluctuations in salinity (Geddes, 2000). Major groups in the Coorong and Lower Lakes include the Amphipods and Gastropods (particularly Hydrobia) that are highly abundant in microphyte beds (large-fruit tassel), and polychaetes and bivalves that are abundant in the soft sediments of the central parts of the lagoons (Geddes, 2000). A stable water level in the southern Coorong is important for widgeon grass. The waters of the Lower Lakes, Mouth and Coorong support 78 species of fish, mostly of marine origin. The fish of the Coorong lagoons include species that move between the sea and the Coorong, and species that are resident in the Coorong. Fish species are favoured by good access between the Coorong and the sea, and when salinities are estuarine in the Northern Lagoon (Geddes, 2000). An open Mouth promotes the flux of nutrients which is favourable for productivity and enhances the survival prospects of larval and juvenile fish. The reduction in area of the highly productive estuarine habitat appears to have affected the abundance of commercial and non-commercial fish species (Geddes, 2000). Most of the freshwater fish of the River Murray have been recorded from the Coorong. These are fish that have been flushed past the barrages during high flow periods. They are not able to return to the freshwater lakes and die from either high salinity or predation (Geddes & Hall, 1990). The outflow of water from the Mouth attracts large mulloway to spawn, and encourages juvenile mulloway and Australian salmon to enter the Coorong (Geddes, 2000). The pattern of mulloway catches follows the pattern of freshwater outflows, with a lag of about two to three years (Geddes & Hall, 1990; Geddes, 2000). Geddes (2000) reported that bream catches were consistently 100+ tonnes/year in the 1970s, but are now as low as 3 tonnes/year and declining. This may be partially due to changes in fishing practice. The distribution of fish species is also highly dependent on the salinity gradient, so the relative numbers of various species found in different parts of the Coorong alters according to salinity variations (Geddes & Hall, 1990). One consequence of restricting the size of tidal prism with the barrages has been loss of the gradual salinity gradient. Instead there is a large variability in salinity, which fluctuates at short time scales (Brookes, 2002), and this change is expected to have altered fish distributions. The importance of access to Lake Alexandrina via channels and creeks across the islands at times of high lake levels or high tides has been emphasised. This may be particularly important for obligate migratory species such as the common Murray jollytail and Congolli (Geddes, 2000). The Lower Lakes and Coorong region is important for commercial fishing, in the past having supplied as much as 50% of South Australia's scalefish production. Almost all of the commercial supply of Mulloway, Black bream and flounder in South Australia comes from the Coorong (Geddes & Hall, 1990). However, the fishery for some commercial species is said to have declined (Hera-Singh, reported by Geddes, 2000), particularly for Mulloway and flounder (Geddes & Hall, 1990). This has been at least partly attributed to loss of the Lakes as an estuarine area, the reduction in freshwater outflows, and the presence of the barrages as a barrier to fish movement (Geddes & Hall, 1990). Hera-Singh (2002) predicted that closure of the Mouth would affect some commercial species more than others, but that a prolonged closure would result in lower catches for the fishing industry. Estuarine fish spawning preference curves were developed by Qifeng Ye and Gary Hera-Singh for the Murray Flows Assessment Tool (MFAT) modelling process (Australian Water Environments et al., 2003). These curves were based on observations by experienced local commercial fishers, scientific studies on the key estuarine species (e.g., Black bream) and in the Coorong, and scientific reports. Freshwater flows from the Lower Lakes through the barrages allow mixing into the Coorong, creating estuary conditions, which are critical for the recruitment success (spawning/nursery) of the estuarine-dependent fish species. Freshwater flows into the Coorong during the spring/summer (temperature dependent) stimulate the estuarine species to spawn, but a protracted period of estuarine condition extending to late summer with a gradual tail-off of the freshwater flows to the Coorong, and a gradual change of salinity, is critical to enhance the survival of larval and juvenile fish. Barrage opening and freshwater flows are also critical for the migration needs of diadromous species (e.g., lamprey, eels) to complete life cycle. For estuarine fish spawning: the ideal duration is 60 days at peak flow, with 50 days rise, 50 days recession; ideal timing is September, October, November; and the ideal range of magnitude is 10,000 to 20,000 ML/d. In another report, Australian Water Environments (2003) defined estuarine fish spawning flow events as flows greater than 5,000 ML/d for 50 days or more during the fish spawning season. Surveys of phytoplankton composition and abundance have been conducted in the Lower Lakes since the 1950s. In recent times the emphasis has shifted towards investigating toxic algal blooms in Lake Alexandrina. The model of Geddes (1984; 1988) recognises turbidity as a key factor in determining the distribution of phytoplankton, through its effect on the underwater light environment and also on nutrient concentration. Generally, increased turbidity implies increased nutrient concentrations (Newman, 2000). Low summer turbidity in combination with reduced flow levels increases the risk of algal blooms, particularly blue-green algae (Baker, 2000). Biomass of phytoplankton is also conditioned by flushing rates and sedimentation rates and grazing by zooplankton (Baker, 2000). Brookes (2002) ranked flow as the primary factor affecting the development of blue-green algae in the lower River Murray, with water source (and thus turbidity and phosphorus concentration) being the second main factor. Data compiled up to the mid-1980s indicated that the turbidity of the Lower Lakes had increased as a result of relatively highly turbid Darling River water making a more significant contribution to the lower River Murray water budget (Mackay et al., 1988). Wind also affects turbidity and nutrient levels, and blue-green algae growth in the summer and autumn months could be dependent upon internal recycling of phosphorus from the sediments. The first reported blue-green algae bloom occurred in Lake Alexandrina more than 100 years ago (Baker, 2000). Although algal blooms did occur before regulation, there is general consensus that the incidence of blue-green algae blooms in the Lower Lakes has increased with time (Baker, 2000). Toxic algal blooms represent a risk to human health, and they impact on agricultural and recreational activities. Closure of the Mouth would assist in development of stratification of the Lower Lakes, which is a condition that promotes algal blooms. At the same time, stratification could also promote release of nutrients that are stored in bottom sediments (Brookes, 2002). The traditional owners of the Murray Mouth area are the Ngarrindjeri people. They are strong advocates of maintaining and improving the health of the Murray Mouth, Coorong and Lower Lakes environment, and are especially concerned about Mouth closure. The Murray Mouth is part of an area that is fundamentally important to the health of Ngarrindjeri people. A significant part of the Ngarrindjeri lands and waters is within the Coorong and Lower Lakes Ramsar site. The Indigenous peoples have a fundamental role to play in sustainable management (Hemming et al., 2002). In their submission to the Ramsar management plan the Ngarrindjeri Ramsar Working Group supported the principles of `wise' and `sustainable' use of the wetlands (NRWG, 1998). With respect to maintaining the Mouth in an open status, dredging of the Murray Mouth and surrounding areas is considered by the Ngarrindjeri to be culturally inappropriate, and they insist that a longer-term solution be found through proper and appropriate planning (Hemming et al., 2002). The area is significant for recreational fishers, with around 15,000-20,000 anglers visiting each year (Geddes, 2000). The attraction is the variety of fish that occur in the area, plus the attractiveness of the scenery. Recreational fishers can use four-wheel drive vehicles or watercraft to reach the less accessible parts of the area. The most popular recreational fish catches are Yellow-eye mullet and Mulloway (Higgins-Desbiolles & Jones, 2002). Nature-based tourism is of growing interest in the Coorong and Lower Lakes area. Few data on tourism numbers are available, but it is known that 106,200 visitors were recorded in the Coorong National Park in 2000-01 (Higgins-Desbiolles & Jones, 2002). Recreational boating is a significant activity in the area, with the number of trailerable watercraft in regular use estimated to be not less than 6,000, with a total use at 120,000 user days per year. The non-trailerable areas have an estimated 800 watercraft in use (Higgins-Desbiolles and Jones; 2002). Sedimentation of the Mouth was considered a hazard for boaters, and they would tend to move their activities upriver. The high conservation value of the Murray Mouth, Coorong, and Lower Lakes has long been recognised, evidenced by listing of the Coorong and lakes Alexandrina and Albert as a Ramsar site in 1985. The area is highly diverse in habitat types, and is rich in flora and fauna, including threatened species. Of the various factors impacting the health of the SEA, the altered water regime due to river regulation and construction of the barrages are the factors with the greatest potential to affect flora and fauna. The River Murray estuary would have naturally offered a wide range of fresh, brackish, saline and hypersaline systems. The winter and spring river flows would have maintained the Mouth opening in most years, although in dry years, and during the low flow periods of the year, there would have been considerable tidal exchange and semi-marine conditions would have prevailed. Mouth closure would have been an occasional possibility under the natural flow regime. The barrages block 7.6 km of previously navigable channels, and prevent ingress of water to Lake Alexandrina. This maintains fresh water in the Lower Lakes and River Murray. Before the barrages were built, tidal effects and the intrusion of seawater were felt up to 250 km upstream from the Mouth. The regulated regime presents conditions that are more conducive to Mouth closure than prior to regulation, although the only time that the Murray Mouth has closed in recorded history was in 1981 (dredging may have prevented closure in recent years). The numbers of almost all species of waders and waterbirds using the wetlands of the Coorong and Lower Lakes are considered by experts to have dramatically declined, particularly over the past 30 years. Weed invasion and a dramatic reduction in plant biodiversity have occurred, due to various factors (including grazing and changes to water level, salinity and turbidity regime). The aquatic flora is now restricted to the littoral zone and inshore areas, while anecdotal evidence suggests that these plants were once more widely distributed. Floodplain vegetation communities are also degraded. The management of the saline-freshwater interface over a very narrow range has effectively removed the habitats that represent the transition from saline to freshwater. Estuarine macroinvertebrates have suffered reduced habitat area. The fish species present in the Coorong are favoured by good access between the Coorong and the sea. The Lower Lakes and Coorong region formerly supplied as much as 50% of South Australia's scalefish production. The fishery for some commercial species is said to have declined, particularly for Mulloway and flounder. This has been at least partly attributed to loss of the Lakes as an estuarine area, the reduction in freshwater outflows, and the presence of the barrages as a barrier to fish movement. Flow has been ranked as the primary factor affecting the development of cyanobacteria in the lower River Murray, with water source (and thus turbidity and phosphorus concentration) being the second main factor. Although algal blooms did occur before regulation, there is consensus that the incidence of cyanobacterial blooms in the Lower Lakes has increased with time. The source of much of the flow in the River Murray at the Mouth is winter rainfall and snowmelt on the Great Dividing Range. Not only is the source of flow distant from the Mouth, it is also highly variable. The natural average annual flow is 11,000 GL, while some wet years have natural discharges of 40,000 GL, and drought years deliver virtually no flow to the Mouth (Jensen et al., 2000, p. 14). Regulation of the river system by headwater storages and diversion structures has dramatically reduced the volume of flow delivered to the estuary. Being at the downstream end of the River Murray System, the hydrology in the Lower Lakes and downstream is the culmination of multiple upstream changes. The degree of hydrological change relative to natural condition is statistically summarised in Box 6.1. There has been a threefold reduction in the frequency of medium-sized flood events (20,000 - 80,000 ML/day), and the duration of these events has also decreased (Jensen et al., 2000, p. 19). Years with annual flows <5,000 GL occurred 7% of the time under natural conditions, but now occur 66% of the time under regulated conditions (Thomson, 1992; Jacobs et al, 1997). Flow to the Murray Mouth now ceases on average once every two years, while before regulation this was experienced once every twenty years (Jensen et al., 2000, p. 78). There are Periods of four to five years when `little outflow can be expected' (Close, 1990). At the barrages, the median annual outflow from the Murray system to the sea is now 27% of the natural outflow (Maheshwari et al., 1993, p. 17; Gippel et al., 2002). The original indicator of hydrological stress developed in the pilot Sustainable Rivers Audit framework indicated that the flow regime in this river zone is the most modified relative to natural. Figure 6.4 - Median monthly flows over the barrages under natural and current conditions. Source: MDBC. Figure 6.5 - Comparison of monthly flows over the barrages for natural and current conditions-109 years of modelled data. The increase in white area under current conditions compared to natural conditions shows that flows of less than 2,000 ML/d are much more frequent now. Source: MDBC. Figure 6.6 - Comparison of daily water levels at Milang (on Lake Alexandrina) under natural and current conditions. Source: MDBC. The distribution of the median monthly flows under natural and current conditions over the Barrages is shown in Figure 6.4. The area between the curves is a measure of volumetric flow change (mainly diversions and losses). There are eight months (November - June) when the median monthly flow is less than the minimum median monthly flow in any month under natural conditions (Figure 6.4). The seasonality is similar, although considerably truncated in the current case. Further detail to highlight the change in flow patterns on a monthly basis is provided on Figure 6.5, which is a summary of modelled hydrological data from 109 years of record. In addition to the change in the flow regime due to regulation and diversions upstream, the operation of the barrages has significantly changed the hydrological regime of the Lower Lakes. Lake levels are currently managed to maintain a constant water level of 0.78 m relative to the Australian Height Datum (AHD) where possible, removing much of the natural variability. Figure 6.6 illustrates the change in water level variability, with a constant level maintained for almost 60% of the time. Walker (2002a, b) quantified the degree of opening of the river Mouth on the basis of the ratio of tidal energy in the estuary inside the Mouth to that in the sea outside the Mouth. The more closed the Mouth becomes the greater the difference is in tidal energy, because the closure prevents sea water moving into the estuary. So, the more constricted the Mouth becomes, the lower the value of relative tidal energy is. Walker (2002a, b) found that the relative tidal energy at any time was a function of the relative tidal energy in the previous month, and the flow in the river over the previous two months. The degree of Mouth opening was expressed by Close (2002) in terms of the `Mouth Opening Index' (MOI), which is another name for the relative tidal energy as described above. The model of Walker (2002a, b) only explains about half of the variation in relative tidal energy, and because low values of the MOI do not necessarily mean that the Mouth will close (the Mouth has only closed once in historical times), the MOI is best seen as a measure of the risk of Mouth closure. Close (2002) proposed that there was a risk of Mouth closure when the MOI was below 0.05. Analysis by Close (2002) found that under natural conditions the risk of Mouth closure was negligible, while under current conditions 31.5% of years have a risk of Mouth closure (ie MOI<0.05). It appears that altered flow regime due to river regulation through the construction of the dams and weirs, and construction and operation of the barrages are overwhelmingly the most significant factors explaining the decline in health of the Murray Mouth, Coorong and Lower Lakes area. These changes have affected water quality, algal blooms, invertebrates, birds, fish, plants and human use values. However, there are other factors that have had a lesser, but still significant, impact. At the southern end of the Coorong, intentional alteration to the drainage pattern has influenced the South Lagoon. Drainage works constructed between 1864 and 1912 enhanced freshwater inflow to the Coorong via Salt Creek, while later works gradually reduced these unnatural flows, so that they had stopped by 1972 (Geddes & Hall, 1990). During the first few decades of the enhanced Salt Creek inflows, fish numbers are believed to have been higher than the current level, but it must be remembered that at this time the degree of river regulation was less than now, and the barrages were not in place, so healthier fish numbers would be expected regardless of what was happening in Salt Creek. The Ngarrindjeri believe that the Upper Southeast Drainage Scheme's waters should be added to the Coorong at Salt Creek, as many Ngarrindjeri elders can remember freshwater flows from Salt Creek into the Coorong during the late 1950s and believe these flows brought new life to the Southern Lagoon (Hemming et al., 2002). In contrast, DEH (2000) listed the redirection of surplus drainage under this scheme as a threat, because it will change the hypersaline conditions in the Southern Lagoon. Increased turbidity from a large proportion of water being sourced from the Darling River system can lead to increased nutrient concentrations and algal bloom risk. Clearance of native vegetation, especially around the edges of the Coorong and Lower Lakes has resulted in a more windswept environment with more wave action and re-suspension of silts and clays, which has increased turbidity (DEH, 2000). Noisy boats can disrupt bird feeding and nesting. Boats near nesting colonies can result in birds leaving the nest and then becoming prey to larger birds (DEH, 2000). Introduced plant and animal species are present in the area and they represent a threat to the health of the ecological assets (DEH, 2000). • extended dredging as required to remove large sand deposits (MDBMC, 2004). These flow, structural and operational works and measures are required to fully meet the ecological targets developed for the Murray Mouth, Coorong and Lower Lakes. However, it should be noted that as the desired environmental outcomes are sometimes best achieved through flow allocations and works and measures outside of the location of this asset (i.e., at upstream SEAs). The Mouth opening model of Walker (2002a, b) was used by Close (2002) to assess a number of options for modifying the flow regime to reduce the risk of Mouth closure. The hydrological indicator used for assessing the flow scenarios was `percentage of years with a risk of Mouth closure' (i.e., percentage of years with a minimum MOI <0.05). Based on observations made following Mouth closure and subsequent artificial opening in 1981, it was suggested that flows of 25,000-30,000 ML/d were required to expand and maintain the artificial opening (Walker, 2002a, b). The Mouth was again approaching closure during the protracted drought conditions beginning in 1998. In December 2000, a natural flood peak to South Australia was enhanced by an appropriately timed release from Lake Victoria. This resulted in unintentional scouring of sand at the mouth (Gippel, 2003). Mundoo Barrage was opened fully (for the first time since 1996) in the belief that its proximity to the Mouth would offer the most effective means of moving sediment from the Mouth. The flood peak upstream of the barrages was about 40,000 ML/day, but it was of a short duration and had a rapid rate of recession. Water surcharged in the Lower Lakes was utilised, in conjunction with the arrival of the River Murray flood peak, to produce a short-term flow of about 11,000 ML/day from Mundoo Barrage for about 16 days (Gippel, 2003). The December 2000 flushing operation did not scour significant volumes of sand from the Mouth, partly because the flow rates were not sufficiently high for long enough duration. However, consistent with an adaptive management approach, the operation provided useful knowledge for the development of strategies for management of the Mouth (Gippel, 2003) into the future, and the expression of hypotheses about its behaviour. Modelling suggests that there is a risk of Mouth closure as a result of increasing South Australia's entitlement each year from 4,500 ML/d to 20,000 ML/d. Providing this large flow once per year was estimated to have only a relatively small impact on risk of Mouth closure. 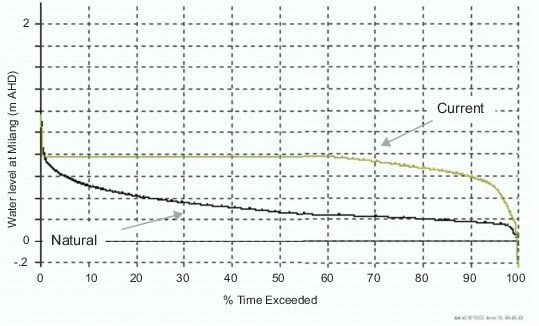 The percentage of years with risk of Mouth closure (MOI <0.05) reduced by about 20% (Close, 2002). By providing an even baseflow over the barrages each month, the flow in the river would tip the balance in the Mouth to a net outward flow that would assist in preventing sediment entering the inlet during a rising tide, and assist in flushing sediment during an ebb tide (Walker, 2002a, b). Close (2002) modelled the impact on risk of Mouth closure of maintaining low flows over the barrages of 2,000 ML/d. Providing this baseflow was estimated to substantially reduce the risk of Mouth closure. The percentage of years with risk of Mouth closure (MOI <0.05) reduced by about 80%. Fears of Mouth closure during 2002 prompted a dredging operation that began in mid-October 2002 (DWLBC, 2002b), with a 690 m long channel opened to the sea on 22 November 2002. This was recognised as a short-term emergency measure, pending a longer-term solution based on increasing flows through the Mouth. The primary objective of this operation is to prevent further accumulation of sediment deposits within the estuarine areas. The project `Restoration and enhancement dredging of the Murray Mouth' (being undertaken by Department of Water, Land and Biodiversity Conservation, South Australia) will develop an optimal dredging regime for sand removal at the Murray Mouth. The project will develop a business case based on current monitoring, morphological modelling and investigations of a number of environmental health indicators to determine whether dredging beyond the current dredging program will benefit the Coorong and Lower Lakes environment (MDBMC, 2004). The remote mechanical operation of the barrage gates was given the highest priority of any structural option in the Environmental Flows Study of Jensen et al. (2000), and is consistent with the Ramsar Management Plan, the Lower Lakes and Coorong Management Plan and the Barrage Operating Strategy being developed for the Coorong and Lower Lakes. The objective of this action is to improving the flexibility of control of barrage releases at selected locations, and thereby reducing salinity variations and water level fluctuations and improving connectivity between the sea and the Coorong (MDBMC, 2004). The installation of 10 remotely operated gates at Tauwitchere Barrage has been adopted as a project under the Environmental Works and Measures Program (being undertaken by Department of Water, Land and Biodiversity Conservation, South Australia) (MDBMC, 2004). The Tauwitchere Barrage was chosen as it is located furthest from the Mouth, will be the first to open on rising flows and is the most difficult to regulate for storm induced reverse head conditions. The MDBC is committed to an extensive fishway construction program on the River Murray between Lake Hume and the sea (MDBMC, 2004). As part of this program, the issue of fish passage through the barrages is being addressed. This project is progressing in stages, with pre-fishway assessment of migratory fish currently under way (Ye et al., 2002). In addition to works already identified or implemented specifically for the Murray Mouth, Coorong and Lower Lakes, most other works considered as part of the Environmental Works and Measures Program will provide enhanced flows to the Lower River Murray system, assisting in meeting the ecological objectives for this part of the system. This may include, for example, enlarging the Lake Victoria outlet capacity. The connection between the ecological condition of Murray Mouth, Coorong and Lower Lakes and flows to the SEA has been firmly established. Other factors are known to affect ecological condition of the SEA, but flow regime is of fundamental importance. Reduced flow volumes, reduced frequency and duration of medium-sized flood events in spring, and increased risk of Mouth closure are the main factors implicated in observed environmental changes in the SEA. The proposed opportunities for managing flows in the SEA aim to reverse or partially reverse these hydrological effects of flow regulation. An environmental allocation can be used (along with dredging as required) to help maintain the Mouth in an open condition and to generate flows to trigger breeding of many fish species in wet years. Remote control of barrage gates will allow greater control over flows into the Coorong, which will extend the length of time that ecologically suitable hydraulic and hydrological conditions prevail. These actions will help achieve a healthier Lower Lakes and Coorong estuarine environment in an open Murray Mouth, more frequent estuarine fish spawning, and enhanced migratory wader bird habitat in the Lower Lakes.